Fried Pork, Shrimp & Shitake Wontons | Just Cuc It! For our first potluck dish this holiday season, I wanted to make something special for our friends’ (Kathy & Andy) dinner party. These are opportunities to cook something special to share with others, not a stop-by-the-market-and-pick-up-something-on-the-way type of thing! The dish went through many iterations in the brain of Cuc 😉 I started in my comfort zone. . . knowing how much this particular family lovvvves my Vietnamese shrimp egg rolls, I could’ve played it easy and stuck to it! BUT . . . Josh and I spent the past couple of weeks helping a good friend out by rolling some Boudin eggrolls for a HUMONGOID (like 1500 of ’em) catering order she had. (Shout out to Lisa!) 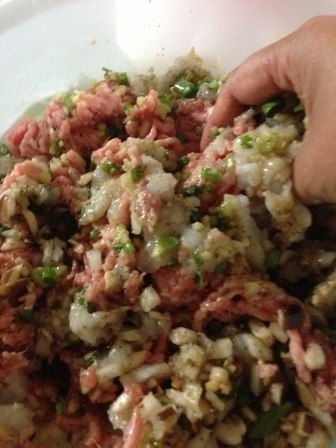 I had been thinking about trying my hand at my own Boudin egg roll, with homemade boudin! 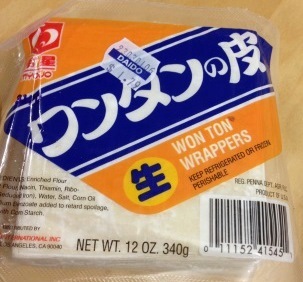 To make a long story short, I settled on wontons because my HEB did not sell vietnamese egg roll wrappers that I would’ve needed for the Boudin eggroll recipe and all I could find at the nearby Japanese market were wonton wrappers! LOL! Yes, I was too lazy to drive an extra 5 miles and bear the traffic and the drizzlling rain to my regular Asian market in Chinatown! Set your wrapping station up. Place beaten egg in a shallow bowl, and separate wrappers (this should be relatively esy, wonton wrappers are dusted with flour on both sides to keep them from sticking together). Place a large sheet of parchment paper as the wrapping surface on your table. With a spoon, scoop the meat mixture (about nickel size) onto the center of your wrapper. Fold one corner to the opposite corner and press corners together to make them stick. 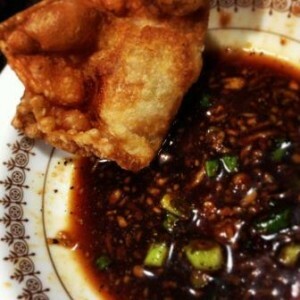 With your index finger, push one of the opposing corners in towards the center of the wonton. Repeat on the other end. Make sure all the sides are sealed well. 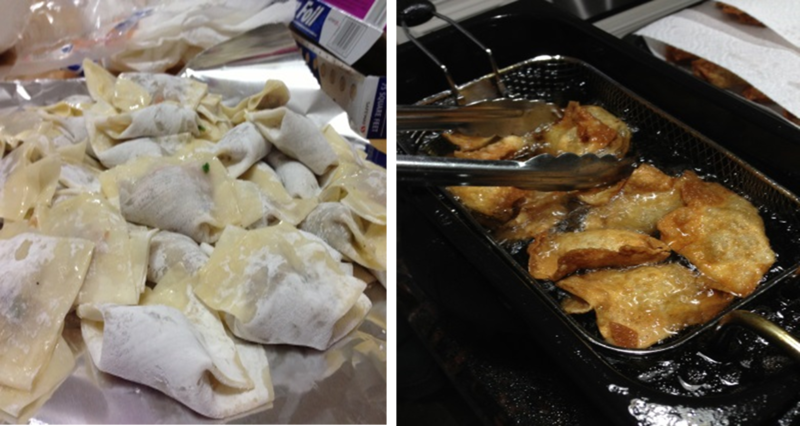 Place on parchment paper and continue wrapping more wontons. Place on paper towels to drain excess oil and serve with dumpling sauce! Dumpling sauce recipe is in my Chicken Lettuce Wraps post!